Merry Christmas! Isn’t it wonderful that despite whatever changes or turn of events happen in a year, the season of Christ’s birth reminds us of the blessings God had given us? This Christmas is no exception for our family. After being displaced from our home for the last three months due to water damage from a flood, we are finally getting ready to move back in! Although it was tough at times, God has been so gracious and has blessed us with a smooth insurance claim process and flexibility in Kevin’s work schedule that have both helped move things forward. To top if off, we had fun “reconfiguring” some aspects of the house since the drywall was already torn out. Now we’re anxious for the finishing touches to be completed so we can move back in and decorate for Christmas, all at the same time. Despite the unpredictable events of this past year, Katie and Eli both continue to grow and mature. Kaitlyn has become quite the little engineer lately. He favorite playtime activities revolve around using any object she can find as an improvised rope. While indoors, she will use scarves or ribbons to tie intricate webs around her room, connecting the furniture, door knobs and toys, often creating knots so difficult that Mommy and Daddy have trouble undoing them. Outside, this has transla ted to building tree-climbing apparatus, swings and hammocks, all with an old length of a garden hose. It’s quite comical seeing the level of detail and concentration that she puts into her “projects”, in fact, it shows us that she’s long overdue for a real swing set. Eli has really been enjoying starting preschool this year. He only attends twice a week, but he loves interacting with his teachers and his social skills have grown immensely. He also loves doing make-believe play at home, pretending that he’s performing in a marching band as the drum major, a tuba player or a percussionist (his imagined role changes daily). Mom and Dad have kept themselves busy with making repairs to the house while trying to keep up with the other regular duties of life. Sarah continues to enjoy the benefits of being a stay at home more, like attending MOPS activities and scheduling play dates with other moms. She has also had fun in the kitchen, making homemade bread, apple butter, and candied nuts, plus she’s been practicing her cake decorating skills (much to the delight of the rest of the family!). Kevin has stayed fairly busy on the road for work this year, spending lots of his time on the East Coast as well as some international locations like Malaysia, Mexico, Brazil, and Canada. While life on the road has been tiring at times, he really enjoys getting to know the customers that attend his training sessions. When he’s home, he really enjoys being around for some of the day-to-day activities, like taking the kids to preschool or running errands with the family, and he’s gotten lots of chances to practice his carpentry skills during both of the full remodels we’ve completed on our home this year. In addition to spending most of the last three months in construction mode after the flood, the rest of the year has also been an adventure for our family. For example, we were able to use some of Kevin’s travel credits this summer and take the kids to Disneyland for their first time; watching their faces beam at each new sight and sound was something neither of us will ever forget. We were also blessed to make our yearly pilgrimage back East again to spend time with our friends, the Dentons, Sarah’s sister and family, plus the Dresslers (the family we traveled with to Kazakhstan). 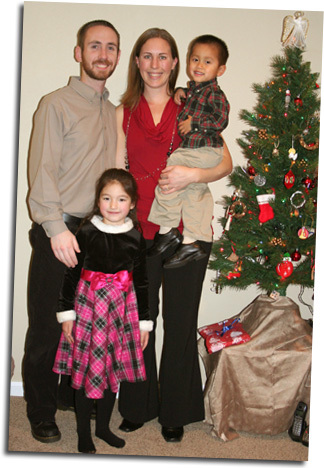 As we head into 2010, we are anxiously anticipating our next adoption. Since Kevin celebrated his 30th birthday this year, we are now both eligible to adopt a special needs child from China. We hope to be bringing home or new little one by next fall at the latest. As we get more information, you can be sure that we’ll be sending out emails, posting on Facebook and updating our website with the news, so stay tuned! We pray you and your family have a wonderful Christmas and that God blesses you in the coming year.